Offering some of the most unique physical landscapes anywhere in the United States, the state of Oregon is an outdoor enthusiast’s paradise. There’s so much to see and discover, both above and below ground. Deep beneath the surface of the Beaver State, twisting and turning tunnels spread out in every direction. Formed by volcanic lava, the lava tubes of Oregon are thousands of years old and are among the state's most astonishing natural treasures. There are many different lava tubes to discover and explore all around Oregon, with each one offering unique features and instilling a sense of adventure in all who step inside. There are many different lava tubes to check out around Oregon, with some offering easier access than others. Some of the tubes are not actually open to the public for safety or conservation reasons, while others are ready and waiting to welcome you in. 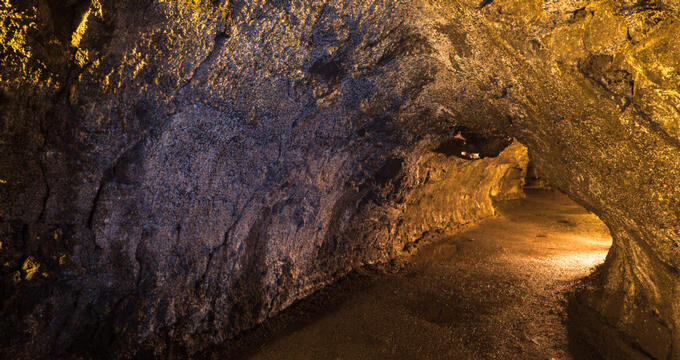 Let’s take a closer look at some of the best lava tubes in Oregon. Located in Deschutes County, not far from the city of Bend, Lava River Cave is one of the best-known lava tubes in all of Oregon. Situated in the Newberry National Volcanic Monument, Lava River Cave runs for over 5,000 feet in length and was discovered way back in the late 19th century. It can be accessed via Highway 97 and is one of the most popular natural tourist spots in the area. A full staircase has been installed for convenient access into the cave and a forest trail leads to the entrance, making this one of the easier caves to explore. It's important to note that Lava River Cave is only open from May through to October each year. Situated southeast of Bend, Boyd Cave represents a bit more of a physical exploration challenge than locations like Lava River Cave. This lava tube has broken down over the years, with piles of rubbles and volcanic sand along the path. The ceiling also becomes progressively lower over time, eventually reaching a point where it simply turns into a tiny crawlspace. It's only a small lava tube, but it's fascinating to explore and has a very unique formation. This lava tube was named due to the fact that a lot of old bones were found near its entrance when it was discovered, but don't worry: they were animal bones. Due to the sheer drop at the lava tube's entrance, many animals must have fallen down over the years. Most of the bones have since been cleared out, but a few remain. The passageways of this lava tube are very exciting to explore, and it's open from May through to the end of September each year. It can be a lot of fun to visit Oregon’s lava tubes and cave systems by yourself or with a group of family or friends, but to get the full, educational experience, it can pay off to book a guided tour. Wanderlust Tours (61535 S. Hwy. 97 Suite 13. Bend, OR 97702 (541 389-8359)), based in the city of Bend, runs two tours per day all-year long into the underground lava tubes of central Oregon. All equipment, include safety helmets and flashlights, will be provided as small groups head out to the tubes and start exploring. Trained guides lead the way, helping you discover each cave's secrets and telling the stories of how these incredible structures formed over time. Wanderlust is the only tour company that operates in the area and has the best lava tube experts in the state, so you know you're getting the best possible experience when you book a guided trip with this company. They also provide full transportation to the caves and visit the lesser-known spots, away from the crowds of tourists. If you’re planning a trip to the Oregon lava tubes, be sure to be prepared. It’s important to note that even on warm and sunny days, the temperature in the caves will always be quite low (around 40 degrees), so it’s vital to dress warmly, with lots of layers. Strong shoes with good grip are also essential, as water can sometimes gather on the floor of the caves, leading to them being quite slippery. Don’t forget that some of the caves have their own strict opening dates too, so it’s important to check ahead of time, and be sure to bring flashlights or glowsticks to light the way.